In-form Thorpe Arnold stretched their lead at the top of Division Three with a home victory over Croxton Kerrial on Sunday. 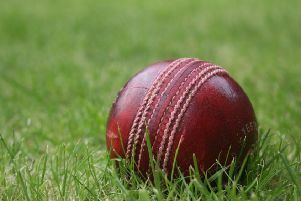 The league leaders turned up brimming with confidence after their convincing win over rivals Whissendine, but George Exton lost the toss for the second weekend running. To his surprise the hosts were invited to bat on a very hard deck, and they made a great start with openers L. Perry (35) and Read putting on 65 before the former was caught off a ball which should have been dispatched for runs. Dom Exton was next in and dominated with the bat from start to finish to make a well-compiled 130. He dispatched Croxton’s bowling to all parts of the ground. Dowse picked up four wickets for Croxton, including I. Perry and Dalton who didn’t really trouble the scorers. Support from Moule (9) and Foldys (14) helped Thorpe Arnold to 233-7 from their 40 overs. After tea, G. Exton and Harvey came out in search of wickets. Exton picked up three wickets and Harvey bowled tight lines to put scoreboard pressure on the visitors. Credit has to go to 15-year-old Will Foldys who caused plenty of problems with his leg spin to finish with figures of 3 for 36 from his 10 overs. Foldys and Durno finally finished off Croxton, bowled out for 145 in just shy of 36 overs. Thorpe: L. Perry 35, C. Read 29, D. Exton 130, M. Dalton 2, I< Perry 0, C. Mould 9, M. Foldys 14*, G. Exton 3*, Extras 11. Total: 233-6. Bowling: N. Howitt 10-0-48-2; L. Aylin 10-1-44-0; T. Dowse 10-1-61-4; C. Smith 3-0-28-0; C. Jeary 7-0-49-0. Croxton: N. Howitt 9, D. Aylin 24, E. Marsh 28, S. Horner 4, L. Aylin 19, C. Jeary 1, T. Dowse 18, C. Smith 12, K. Ainge 11*, J. Lant 4, Extras 14. Total: 145. Bowling: A. Harvey 5.5-0-27-1; G. Exton 7-2-22-3; M. Foldys 9-0-37-2; W. Foldys 10-1-36-3; A. Durno 4-0-15-0.